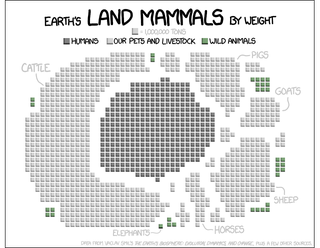 Randall Munroe of XKCD has compiled a chart in which all the world's land mammals have been sorted according to weight. A quick glance shows that we humans — and our livestock — take up a disproportionate amount. Munroe aquired much of this data from a book published by Vaclav Smil in 2011, Harvesting the Biosphere: The Human Impact. Smil says that we're now dominating the biosphere and that our "global anthropomass" is now an order of magnitude greater than the mass of terrestrial mammals. "As a result, our dependence on harvesting the products of photosynthesis for food, animal feed, raw materials, and energy has grown to make substantial global impacts," he writes. Relatedly, and as pointed out by NPR, ants are so numerous that they weight almost 10 times as much as all the world's humans combined. And as Munroe notes, "Bacteria still outweigh us thousands to one—and that's not even counting the several pounds of them in your body." Related: The eight super-adaptable life forms that rule our planet.